"Could this be any more awkward?" There's an allure to being in a band; the fame, the fortune, the sightseeing. Not everyone's cut out for it while others are thrown into the mix. 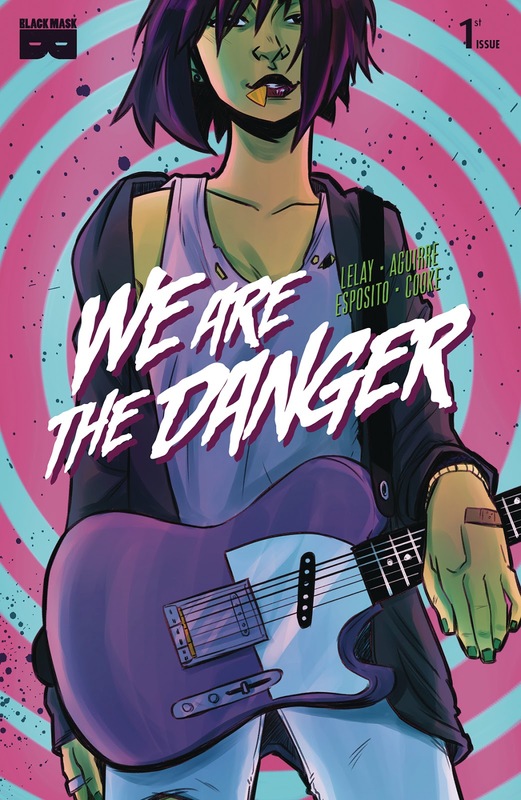 In We Are the Danger #1 from Black Mask the rivalry between two bands puts a new twist on that allure. The issue is written and illustrated by Fabian Lelay, colored by Claudia Aguirre and lettered by Taylor Esposito (lettering assist by Jay Castro). In many ways, We Are the Danger #1 is an origin story, with the main difference being that it's the origin of a band as opposed to a superhero. The narrative is funneled through Julie being the new kid in school and she's a great vehicle for the story of a recently formed band rivalry. Lelay gives her the right amount of unease about being thrust into a new situation, but he counterbalances that with an apparent talent in music that puts her in a great position to help Tabitha in her newly formed band. There's also a pretty solid dialogue balance, where Lelay bounces from conversations to inner monologues to text exchanges pretty effortlessly, filling the pages with realistic interactions that seem to bombard the reader. The issue is paced very evenly as Lelay gets the players to the stage so that the end of the issue sets up the duration of the series nicely. Lelay couples his script with gorgeous illustrations. His linework is sharp and concise, accentuating the characters with thin lines that give them just enough weight to stand out from the almost staged backdrops. Each of the characters have their own distinct looks that allow them to stand out from one another, but Lelay also gives them similar characteristics to help foster the notion that they're in the band community. Despite the book being about bands and rivalries, Lelay doesn't really give the characters and abundance of physicality; that is, most of the issue focuses on the characters conversing as opposed to rocking out. Aguirre's colors are bright and vivid, giving the book an effusive pop. The Scott Pilgrim series has long been viewed as the standard bearer for comics revolving around band rivalries and We Are the Danger #1 taps into a similar mentality. Julie finds herself thrust into the thick of it when she befriends another and watching the rivalry unfold will make for good reading. Lelay's script is breezy and fun. Lelay's illustrations are clean and look fantastic. We Are the Danger #1 is a great first issue that doesn't reinvent the wheel, but it also doesn't have to. We Are the Danger #1 is available now.